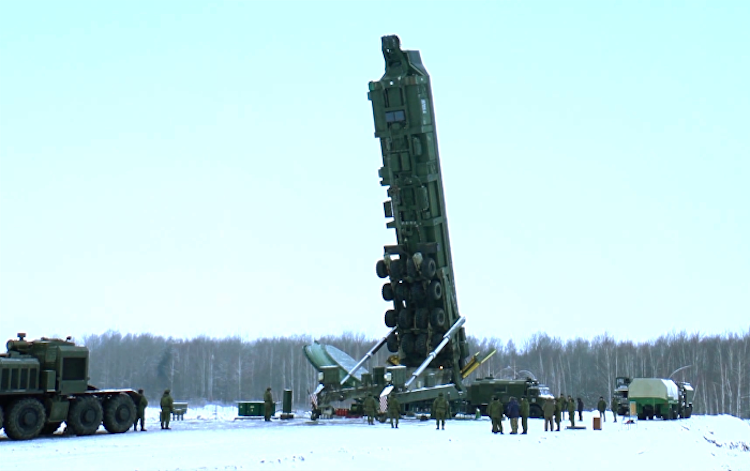 An SS-27 Mod 2 (Rs-24, Yars) is loaded into an upgraded silo at Kozelsk. Image: Russian MOD. 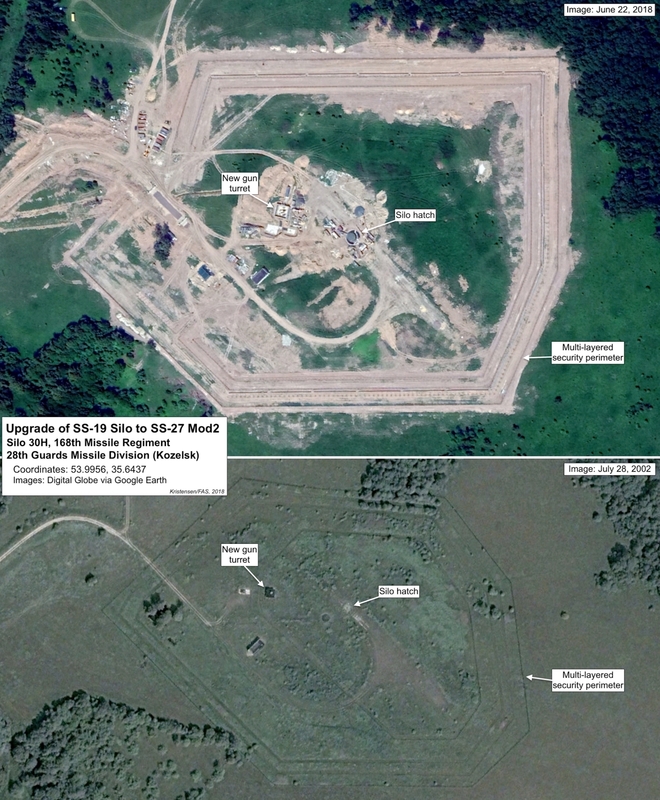 New satellite photos show substantial upgrades of ICBM silos at the missile field near Kozelsk in western Russia. The images show that progress is well underway on at least half of the silos (possibly more) of the second regiment of the 28th Guards Missile Division from the Soviet-era SS-19 ICBM to the new SS-27 Mod (RS-24, Yars). The first regiment of ten silos completed its upgrade in late-2015. Like the SS-19, the SS-27 Mod 2 carries MIRV. 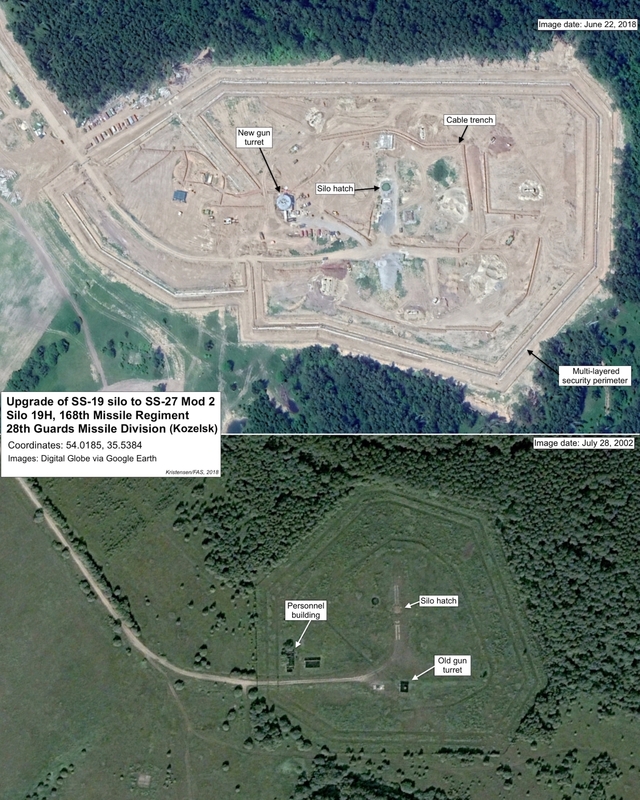 In its earlier configuration of six regiments with a total of 60 silos, the Kozelsk missile field covered an area of roughly 2,300 square-kilometers (890 square-miles). With closure of three regiments, the active field has been reduced to about 400 square-miles. That includes one 10-missile regiment (74th Regiment) that has already been upgraded to SS-27 Mod 2, a second that is being upgraded (168th Regiment), and a third (219th Regiment) that might still operate SS-19s, although the status is uncertain. It is possible that Russia will upgrade a total of 30 silos at Kozelsk. 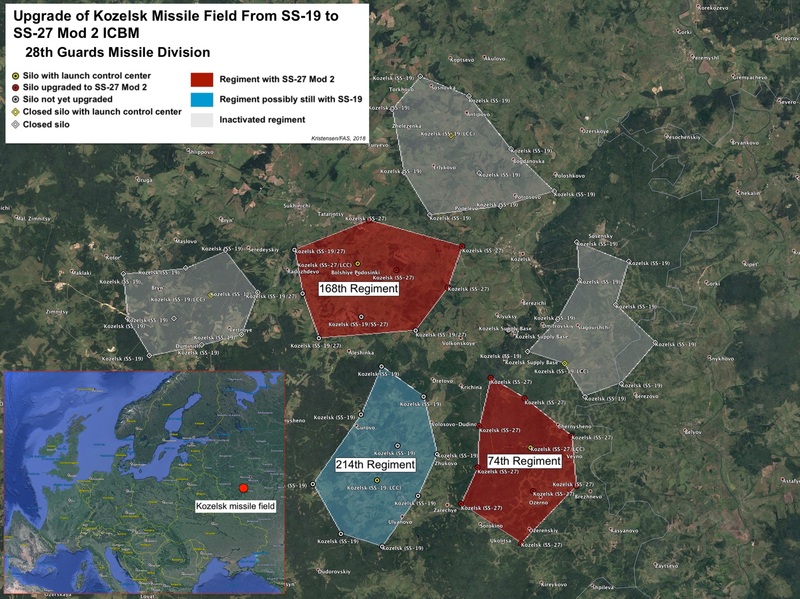 The Kozelsk missile field is located about 240 kilometers (150 miles) southwest of Moscow about 180 kilometers (115 miles) from Belarus (see image below). Each SS-27 Mod 2 ICBM can carry up to four MIRV warheads, each with a yield of about 500 kilotons. Each SS-19 carried up to six MIRV, each with a yield of about 400 kilotons. The New START treaty apparently has forced Russia to reduce warhead loading on some of its missiles. The latest image from Digital Globe on Google Earth is from June 22, 2018. It shows the large launch control center covering 335,000 square-meters (3,620,000 square-feet) with reconstruction nearly completed of the inner area with silo and underground command center. The administrational and technical area has been significantly expanded. A new gun turret is under construction and multi-layered security perimeter has been nearly completed around entire area (see image below). 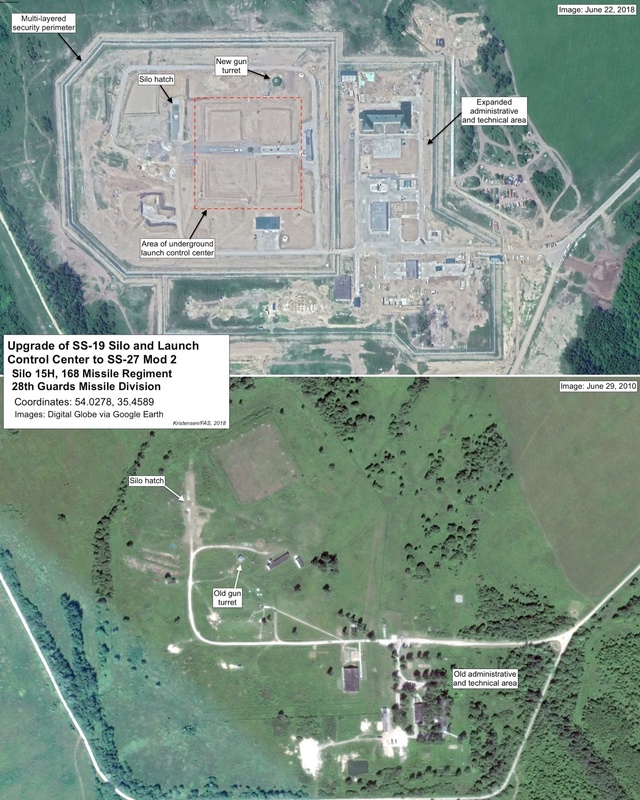 Approximately 5 kilometers (2.8 miles) southeast of the launch control center, upgrade is underway on another of the 10 silos of the regiment. Comparison with an earlier photo from 2002 clearly shows the extensive upgrade, which is expanding the overall size of the facility to 136,000 square-meters (1,500,000 square-feet). Visible work includes a nearly finished silo, a new gun turret, trenches for new cables, and a new security perimeter (see image below). Approximately 7 kilometers further southeast, another silo is being upgraded. This silo covers a slightly smaller are of 120,000 square-meters (1,300,000 square-meters). The upgrade appears to be less advanced with substantial work still going on in the silo, the gun turret not yet completed, no cable trenches visible yet, and the security perimeter only partially done. Visible in this area, however, is a unique entrance feature (see image below). These are just a few facilities of Russia’s extensive land-based nuclear missile force, which has been under upgrade since the late-1990s. The upgrade of Russia’s four ICBM silo missile divisions and seven road-mobile ICBM divisions currently without just over 300 ICBMs is expected to be completed by the mid-2020s. Despite the modernization program, the U.S. Intelligence Community projects “the number of missiles in the Russian ICBM force will continue to decrease because of arms control agreements, aging missiles, and resource constraints,” according to the Air Force National Air and Space Intelligence Center. For a breakdown of Russian nuclear forces, including locations of its entire land-based missile force, see the FAS Nuclear Notebook in the Bulletin of the Atomic Scientists. To compare Russia’s nuclear forces with those of the world’s other eight nuclear-armed states, go here. This publication was made possible by generous grants from the John D. and Catherine T. MacArthur Foundation, Ploughshares Fund, New Land Foundation, and the Carnegie Corporation of New York. The statements made and views expressed are solely the responsibility of the author.